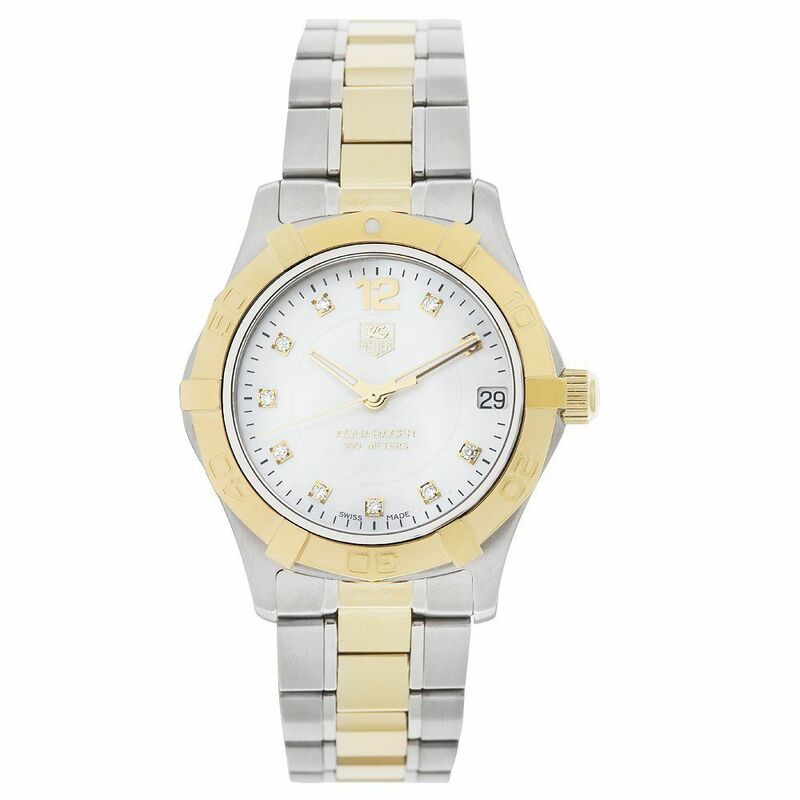 This rich-looking timepiece is for the classy woman. Full with polished and brushed 18K gold, this diamond watch looks elegant and quite fancy. The mother of pearl color in the dial really makes the gold and diamonds stand out nicely. I think the stainless steel band adds to the overall balance of the colors as well. Like all Aquaracers, this watch is made for the water –water-resistant for up to 1000 feet / 300 meters! You’ll never have to worry about water damage with this watch. Take it to the beach, on the boat, or wear it to the pool, this watch is protected and ready to go. I especially like fact that there is a date calendar feature on this watch. Too often I find myself forgetting the date and not being able to find my phone right away. With this date function located at 3 o’clock, you can have the calendar at your wrist for great convenience. Isn’t it wonderful? A great thing about the look of this watch is that it can be worn to many different occasions. Wear this Tag Heuer Aquaracer Ladies Watch to special dinner dates, family visits, work, or even trips to the grocery store. However, I do think it is much more on the fancy side, and would suggest keeping it for special occasions. I also wouldn’t recommend wearing this watch while working out at the gym, as the watch may get in the way of certain activities. Also, I just don’t agree with wearing diamonds while working out…unless they’re in your wedding ring. This watch is listed at $3,000. Although this watch is quite expensive, you’re getting 18K gold, diamonds and great features. Think it’s worth the price? I do. You really do get what you pay for when you purchase this watch. Tag Heuer is a name you can trust.